There is a mountain in Germany locally referred as 'Kilimanjaro', 200 meters tall that attracts 10,000 climbers every year. Since Edmund Hillary and Tenzing Norgay first summitted Mount Everest in 1953, the Himalayan peak has become both the literal and figurative pinnacle of any high-altitude climber's career.From Gravity and 127 Hours to All Is Lost and Unbroken, Hollywood has mined the theme of man versus the elements almost to the point of exhaustion. Mountaineering describes the sport of mountain climbing, including ski mountaineering. While mountaineering began as attempts to reach the highest point of unclimbed big mountains it has branched into specializations that address different aspects of the mountain that requires experience, athletic ability, and technical knowledge to maintain safety. In Europe, it is called Alpinism, implying climbing with difficulty such high mountains as the Alps. From mountains to food – there is no cooked food without salt. Table salt, often called "cooking salt" or just "salt", is widely used in cooking to add flavour to food.It is a compound of two chemical elements, sodium (symbol: Na) and chlorine (Cl) and has chemical name "sodium chloride" (symbol: NaCl). Salt has been used as a preservative and flavour since many centuries. Common salt is a mineral composed primarily of sodium chloride (NaCl), a chemical compound belonging to the larger class of salts; salt in its natural form as a crystalline mineral is known as rock salt or halite. Salt is present in vast quantities in seawater, where it is the main mineral constituent. Salt is processed from salt mines, or by the evaporation of seawater (sea salt) or mineral-rich spring water in shallow pools ~famously Vedaranyam, Dandi and more in India. Edible salt is sold in forms such as sea salt and table salt which usually contains an anti-caking agent and may be iodised to prevent iodine deficiency. Salt is an essential nutrient and the amount of salt in the diet influences health. The most notable differences between sea salt and table salt are in their taste, texture and processing.Sea salt is produced through evaporation of ocean water or water from saltwater lakes, usually with little processing. Table salt is typically mined from underground salt deposits. Table salt is more heavily processed to eliminate minerals and usually contains an additive to prevent clumping. 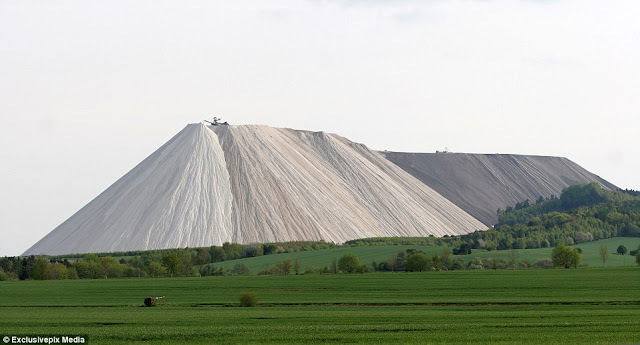 There is lot interesting and strange about - that mountain in Germany – first it is man made; it is a pile that started in 1973 and consists of potash and sodium chloride ! This is an incredible mountain in Germany made from nothing but table salt. Monte Kali, in Heringer, attracts 10,000 climbers every years due to its steep white slopes and unique landscape.The heap, which is more than 200 metres tall, is referred to locally as 'Kilimanjaro' with many coming from across the country to see its unusual spoils. The pile started in 1973 due to potash mining in the area.Potash mining produces a mixture of potash and sodium chloride, which is then dumped at several sites around the region. Four decades later, the heap contains approximately 188 million tonnes of salt, with another 900 tonnes being added every hour. Despite its popularity, Monte Kali and other spoil heaps in the region have been criticised for being environmentally destructive. The surrounding soil has become virtually barren and the nearby Werra river has become inhospitable to freshwater organisms. Monte Kali and Kalimanjaro are local colloquial names for the spoil heap or spoil tip that towers over the town of Heringen, Hesse, Germany. The names are puns of Kali (shorthand for Kalisalz, German for "potash") on "Monte Carlo" and "Kilimanjaro." The heap lies directly next to the border with the state of Thuringia, and hence next to the former inner German border with what was once East Germany. The amount of salt that goes to the region's soil and rivers is enormous. It is reported that the miners are licensed to keep dumping salt at the facility until 2030. Back home, veteran mountaineer Nalini Sengupta became the first Puneite to have a Himalyan peak christened in her honour. Sexagenarian Sengupta, who has scaled several summits, was bestowed with his honour recently after trekkers of Giripremi, a noted mountaineering institute in the city, conquered peak 5260 in the Hamta pass region in Himalayas and decided to name it as “Mount Nalini”, to salute her persistent efforts to inculcate mountaineering in youngsters since 1970. According to the Co-ordinator of Giripremi Mountaineering Institute and leader of Giripremi’s Mount Everest expedition, “Generally, the first team who summits a new virgin peak is granted the honour to name it. Till today, many teams have explored and conquered new mountains. They have named them after their favourite gods, local deities and villages.” “Pk 5260 in the Hamta pass region was a challenge in itself. We named this peak after Nalini Sengupta. Her devotion for mountaineering is nothing less than the altitude of Everest. She already has crossed barriers of lack of funds, equipment and encouragement too.